The opposition Communist Party of India-Marxist (CPI-M) in Tripura on Monday strongly condemned the attacks on their leaders and party workers during fund raising programme in different parts of the State for flood affected victims of Kerala. 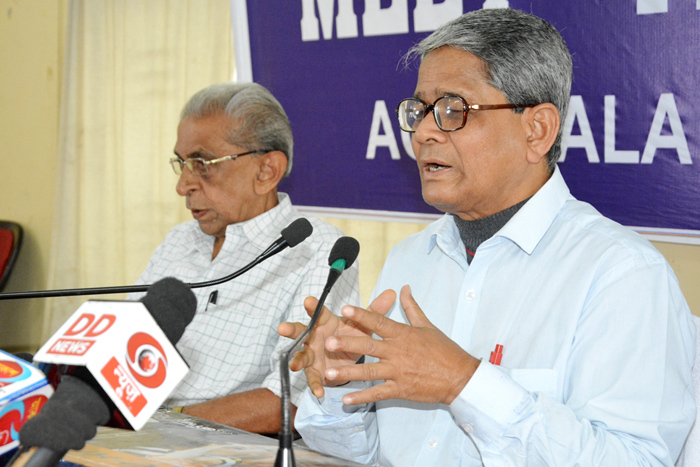 Interacting with media in Agartala, secretary of the state unit of CPI-M, Bijan Dhar, claimed that miscreants patronized by ruling Bharatiya Janata Party (BJP) attacked their leaders and party workers in three separate places of the State during a fund raising programme for Kerala flood victims. Dhar alleged that in Khowai, party workers started their fund raising programme led by former MLA Padma Debbarma and incumbent MLA Nirmal Biswas on Monday. All of a sudden, a group of miscreants led by some local BJP leaders attacked them and prevented them from collecting donations. In another attacked at Belonia town, CPI(M) workers under the leadership of central committee member Badal Choudhury also faced obstruction during similar fund raising drive. Miscreants also pelted stones on them, alleged Dhar. Similar attacks were also carried out at MG Bazar area of Agartala, when party workers led by former deputy Speaker Pabitra Kar were forced to stop the fund raising drive, added Dhar. The CPI-M had started the fund raising drive across the State from August 21 to 31 next for the flood victims of Kerala.